It was 21:00 on May 19 and I was getting ready to go and see ‘SkyFest’, a fireworks display, which was part of the St. Patrick’s Take 2 celebrations. To make sure it was warm enough to head out without a jumper or jacket I opened my balcony door and noticed a huge amount of smoke, looked to the right and saw that the old convent in my complex was on fire! 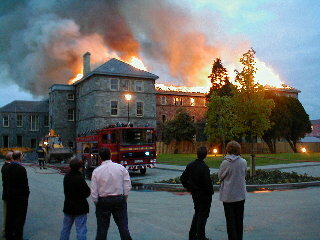 I ran down stairs with my digital camera and told Marian (flatmate) that the convent was burning. She didn’t quite get what I was saying until she came out and had a look too. After taking some pictures with the digital camera I decided to go and get my Cannon SLR and tripod to try and get some decent shots. I think I managed to get some good ones, but I will have to wait and see when I get them back from the photo shop on the weekend. Most of them are on slide too, so I won’t be able to scan them in here. Sorry. I took my camera gear back and headed into the city, but the fireworks had already started so I missed the official show. I think I was the last person allowed back into the courtyard where my house is located, as they evacuated everyone and wouldn’t let Marian back in until after 00:30. 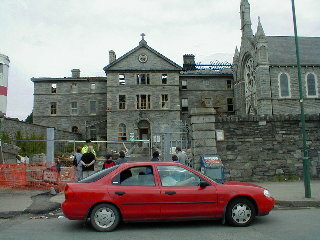 The old convent was being renovated to be turned into apartments. 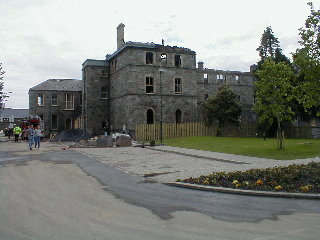 The builders were in the middle of the process, restoring windows, doing plumbing etc. I was even talking to the plumber about the building when he came over to look at a water problem (we had none) in my house. When I asked him what it was like working in there he replied with “It’s a real pain in the arse, as it’s a listed building and we have to work around walls and other obstacles that we can’t change. It would be easier if we just started again.” Quite funny! Maybe it was him! It took around seven fire trucks to get the blaze under control, but the building’s internals and roof were totally destroyed. They had one fire truck with a cherry picker which helped with the roof, but the effort was mostly in vain. Hoses were connected to fire hydrants all over the neighbourhood. They even ran a hose about 500M to a nearby canal and had a fire truck pumping water from there. When I arrived home around 01:30 there were still two or three engines there. The final engine left almost 24 hours after the blaze started, as the fire kept flaring up in different locations. The police put a permanent guard on duty to protect the site until the investigation team could come and determine the cause of the fire. At this stage we still don’t know what happened. 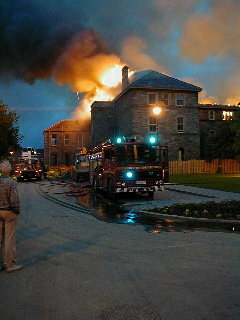 This entry was posted in Ireland, Travel and tagged Convent, Drumcondra, Dublin, Fire on May 23, 2001 by louco73.